I wrote in the previous post about the confusion we find around ideas like “freedom.” I want to try to say a little more about that. Sometimes I translate Buddhist materials from Japanese to English. It’s work I enjoy—in part because it’s so stimulating, but also in part because it’s always an act of letting go. There is much that cannot be authentically translated between the two languages, and in desperately trying to build that bridge, I am asked to consider words and ideas that otherwise, I might just let go. It is a precious opportunity; it’s also an honor to be the one who gives voice to that original text. Two phrases have come up for me over and over again as being particularly tricky, and that makes me all the more determined to try to explain them. These are exciting terms, terms I think we could use. The first is kyōgai (境界): the kyō refers to boundaries, borders; the gai is close to “realm” or “world.” In common speech, this is a common word (pronounced kyōkai), and it simply means “boundary,” the line between this or that. But in the Zen world, as kyōgai, it has a much richer meaning. It is sometimes translated as “level,” though that suggests a kind of ranking, which is not the point. A great artist, through her art, might reveal a very deep kyōgai, or a wide kyōgai, or a high kyōgai. 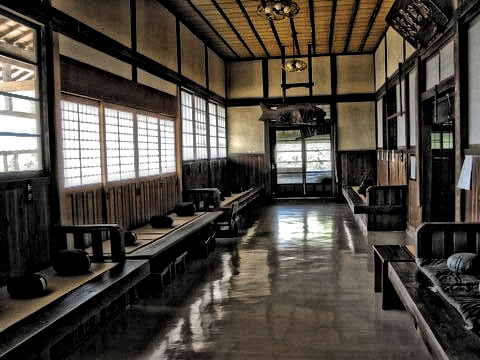 Zen monks will, in every little bow, in the way they sit or stand or respond, reveal their kyōgai. Some people have a shallow kyōgai, though of course it could deepen. It is very difficult to put this into a single word. 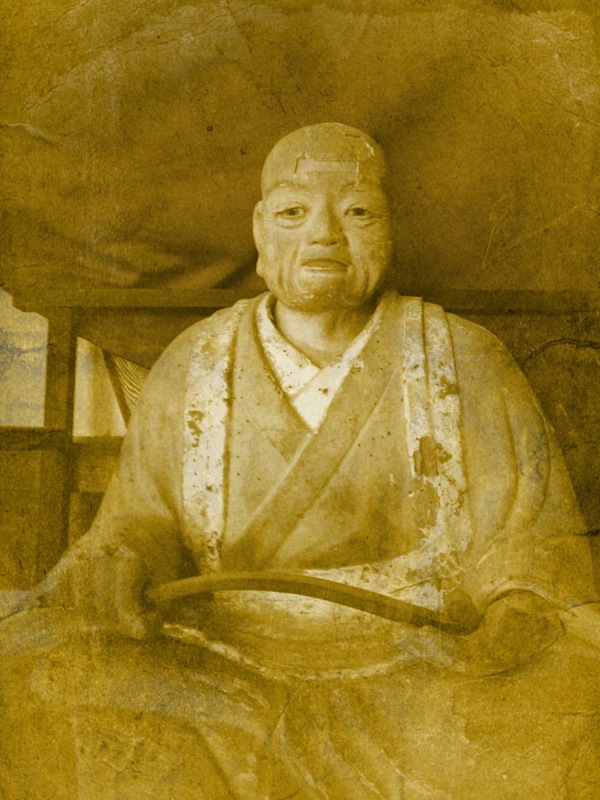 The second is jiyū jizai (自由自在). Jiyū is a common word meaning “freedom.” Jizai means something like “freely,” or “at will.” As a translator, I have struggled with this term over the years, and I have decided, for now, that the best English equivalent is “fluency.” To say that someone is completely fluent at a foreign language is to say that the person can wield that language without hindrance. I can say that I am fluent in English, as a native speaker, because I can (perhaps excepting these translation conundrums) say what I want to say and understand what others say to me. I can adjust my speech according to circumstance. I can read a novel and understand not just the technical meaning of the words on the page, but also the emotional content behind them, and the cultural context which gives them meaning beyond what can be found in a dictionary. Especially as someone who has lived overseas and often functions in a language other than English, I am very aware, when I enter the world of English, that there, I am free. This is fluency. And there are degrees of fluency. Some people speak perfect Spanish, but as non-native speakers, they do not speak with the same idiom as someone born into the language. So even if they are capable of expressing everything they want to say, perhaps they cannot say it in the way that most directly touches the mind of the listener. And perhaps the native speaker needs to make adjustments (eliminating certain idiom and so on) to be sure to be understood. This is still fluency, but a different degree. Jiyū jizai takes this notion of fluency and extends it to any activity. So it is possible to be fluent with, for example, a sword. I have seen karate masters who were fluent with their bodies—they could express and respond freely, unhindered (at least to the eye of the observer). In demonstrating the traditional kata, the forms, it seems that they are creating those forms, even though they are actually following something prescribed from a hundred years back or more. The observer sees not that person, but that person’s action. It is total. Some people are fluent in the kitchen—they can be offered any ingredients, any tools, and make something delicious, apparently without effort. If we are lucky, we have had at least one teacher—math, history, any subject—who is so knowledgeable and so competent in that discipline that we feel we are meeting not just an individual, but the face of the field itself. Meeting even one such person, someone who demonstrates a fluency in any one thing, can change our lives forever. Dancers know about this fluency. Musicians know about it. There are examples in every direction. But what does it mean to be fluent in the context of Zen practice? Traditionally, it has meant that one is so comfortable in each moment of doing things just so—of walking just like this and sitting just like this—that one so embodies his or her own actions that they seem to own those actions, that the “just so” of each movement seems to spring forth not from some rulebook or ancient text, but from the person sitting there, naturally. This is fluency of each moment. This is being fluent at your own life. So, to return to the idea of kyōgai—one’s own realm, one’s own range of movement—kyōgai is, from one perspective, a measurement of this fluency. It is a measurement of the degree to which one is hindered or free in the world, in one’s movements, in one’s thoughts. It is the space in which possibilities exist. It is perhaps a measurement of space, but it is also the freedom one finds within boundaries. And it is this idea of space that is at the heart of practice as I understand it. The space of kyōgai is not just the individual’s. We have all heard of savant mathematicians who can solve problems effortlessly, but who then struggle to explain their process to less able minds. That kind of skill is remarkable, but it is not reflective of a deep kyōgai. A truly great mathematician can invite you in and make you see—if only for a moment—the depth of the world of numbers. A great karate practitioner reveals kyōgai not just when head-to-head with another master, but also in teaching a beginner a basic stance. The great practitioner is working inside of a vast space, vast enough to include others and to meet them there. Living overseas, my definition of English fluency has come to include the ability to adjust one’s speech for those who are not fluent—to do so requires not just ability in English, but also an awareness of, and objectivity towards, how the language works for someone else. Kyōgai is revealed regardless of circumstance, regardless of who else is in the room. And truly deep kyōgai raises the kyōgai of those all around—it offers fluency as something to be shared. What is the goal of Zen? What is it to practice for the sake of practice? What is it to practice for the sake of others? To enter the world of practice is to enter into these questions, directly. We cannot avoid them. Nor can we easily answer them. And we certainly cannot answer them for someone else. But I can offer this: One piece of that puzzle has to do with facilitating practice itself, with becoming the space in which others practice. We can develop certain fluencies intentionally—we can choose to repeat and repeat and repeat, to invest ourselves in this discipline or that activity, until the line is blurred between doer and what is being done. It’s not an easy thing to do, but it is simple. But why bother? What if the fluency of doing things just so is not about that action, but about inviting someone else into a space where there is more possibility than previously imagined? What if I hold my cup in this way, or dress this way, or walk this way, in order to get out of the way and let the practice play itself out freely? What if “practicing for the sake of practice” means that our practice is establishing the causes and conditions of practice–not just for ourselves, but for those around us? This, for me, is at the heart of the teaching of nyohō–the idea that we can cultivate and encourage practice not just with a deep turn of phrase, but with a gesture, or a texture. We can create that space. We can be that space. When I first started reading about Zen, I was struck by the depictions of Zen masters as spontaneous, unconstrained beings. The word “spontaneous” came up a lot, actually. They did and said things that could seem shocking, and they always seemed to have just the right response for any given situation. Zen masters—as they have been presented to us in myth—are masters of a snappy comeback. They seem to represent a kind of freedom. This has been confusing, I think, as Zen has made its way to the West. Zen masters were met on American shores by members of a counterculture that valued freedom above all other things, and there was ample evidence that these little bald men were offering exactly that. That counterculture rejected ideas of rank and formality. It rejected the idea that there were any “shoulds” in spiritual practice. In fact, those bald men came representing a tradition of precision and conformity. Their training had been to do everything—from washing their faces in the morning to bowing to using the toilet—in a neatly prescribed way, the way their teachers had done it and their teachers had done it, for centuries. They were products of one of the most elegantly refined systems of vertical hierarchies the world has ever known. From any Western perspective, they had trained in a very, very tight box. If they had anything to teach, it was born of that training. This surprised people then, and it continues to surprise people now, half a century later. This is not prison. This is not a punishment. I chose to be there. I could walk away anytime. During the first days, this was like a mantra in my head: “I chose this.” In fact, people leave all the time. During spring and fall, when new monks enter, it is not unusual to wake and find that a person is simply gone, that all their possessions have been cleaned away. A phone call later that day will find that monk at home, and we never see him again. No one pressures anyone to stay. The first week, called tangaryō, has been written about a lot, but I’ll add my story. I entered Zuiouji on March 1, and though it had been cold in the days previous, March 1 was a sunny, beautiful day, so I didn’t wear any long underwear or think in terms of keeping warm. After standing outside the gates and finally being granted provisional entry, I was placed with one other monk in tangaryō, a corner room with thin walls and window frames that didn’t quite fit the windows. We were told to sit in zazen all day, and so we did. We knew this was to last a week, but we were constantly threatened with more. Inspecting monks would burst in at odd hours to see if we were really sitting or not. We were told that if we couldn’t use our bowls skillfully by the end of the week, we would be a burden on the group, and would have to stay one more week in seclusion for good measure. We were constantly encouraged to go home, told that we really were not monk material. The first night, I went to sleep tired but full of resolve. The second day, it snowed hard, and the snow came into the room through those ill-fitting window frames and gathered on my lap. Thus began a week of being so cold that I couldn’t stop shaking, ever. At night, in bed, I shivered so hard that my jaw ached, and I often felt I couldn’t breathe. And of course, doing zazen literally all day every day, my legs felt as if they’d been hit with hammers. I would lie in bed, moving between two thoughts: first, that I had chosen this, and second, that I did not know why. I tried every kind of pep talk, every kind of mental game imaginable to somehow escape that physical reality, or to feel better, or to feel stronger. I felt I had been reduced to nothing, in a matter of days. But around the fifth day, I gave up. I gave up trying to make it better. And I gave up hope that it would get better with time. I had settled into a very cool place, as if sitting still in the most remote chamber of a deep, deep cave. I did not feel warm—I was still freezing. My legs still ached so badly that it was difficult to walk to the bathroom and back. I had chillblains on my ears—they looked, and felt, as if they were made of bloody crepe paper. I had let go of my fantasies about how wonderful this would all be, how spiritual. I no longer imagined that I would be transformed here into a certain kind of person, or that I would learn things that no one else knows. I could see in the monks who visited us that while some were quite kind in their strictness, all were human, and some were simply children, enjoying power over someone of lesser rank. Even in seclusion, I could see clearly that this monastery would not transform us all into walking embodiments of compassion. Until that day, I could not have known how much baggage I had carried with me into that monastery. So I gave up. But I did not quit. I did not do what a rational person might do, which is to pack up my things, politely thank everyone for the food and shelter, and go home. I cannot say why I didn’t leave—I’m certain that at times in my life, I would have. But I stayed. It may seem too simple, but now, years later, much of my understanding of Zen practice comes down to just this: to give up, then to continue anyway. If we delve into classical Buddhist texts and teachings, we come across the word “liberation” countless times: liberation from suffering, liberation from desire, enlightenment as liberation, the liberation of all beings, and on and on. And Zen—again, especially in what we’ve received in the West—seems to add to that this word freedom, this idea of being somehow unbound. Both of these words, liberation and freedom, absolutely belong in any conversation about spiritual practice. But, as with all the keywords of the tradition, they also require extreme caution. Perhaps the greatest mistake we can make in this practice—or in any endeavor, any relationship, anything we undertake—is to have a clear idea of what success looks like. I, like many, have watched my definition of success change over the years, but it has always been there. At first, in high school and in college, I understood Zen to be something mental—reading about koans led me to believe that Zen was about breakthrough experiences and realizations that caused a permanent shift in the mind. My assumption was that there was something I was not seeing, some great universal truth that was the domain only of the initiated, of the enlightened. I wanted to see that. I pictured that it would come to me in a flash, and that my thoughts and actions from that day forward would be based on a greater truth than what ordinary people could understand. Later, after I had started sitting and had met others engaged in the practice, I held on to this idea of a mental realization, but my focus shifted from that experience to being a particular kind of person. I had tasted a bit of the discipline of Zen practice, so I imagined that if I continued, I would become a model of discipline, a kind of spiritual warrior, unstoppable in my pursuit of truth, and recognizable—to myself and others—as, again, one of the initiated. When I was very young, I watched Star Wars and wanted to be a Jedi; Zen, I think, offered me a real-world path to achieving that status. Over the years, I broadened and narrowed my gaze. In many instances, my vision of a true practitioner was based on compassion and compassionate action; at other times, it was all about insight; at other times, it was about single-minded focus, a kind of clarity of gaze. Every time I sat down and faced the wall in zazen, I wanted something. When zazen felt good, I imagined myself to be in the process of becoming the person I imagined; when it felt awkward or difficult, I despaired at my failure, or questioned the practice all together. For the record, I don’t think we can avoid this goal-seeking mind. Especially in the beginning. “Practice for the sake of practice” means nothing if you’re not actually practicing, and to actually practice, there must be some draw. There must be some reason, some hope—perhaps we can’t even define it to ourselves, but there is something we look for when we sit down on that cushion for the first time, or we would not sit there at all. So this is a problem we cannot avoid. But it is a problem. Over the course of years of practice, do people develop some insight? Do they investigate the nature of compassion? Do they become more intentional in their own behavior? I do not doubt that many of them do. That practice sometimes bears fruit should not be surprising, and we can celebrate when it happens. The problem is that by defining freedom, or insight, or compassion, we limit them. We rob them of their true boundless nature, and in the process, we eliminate any possibility of seeing that nature for ourselves. To say “I desire freedom” is, whether we mean to or not, to have a definition in mind of what freedom really is. But that definition is wrong. Because to imagine that you want freedom is to say that you are not now free; a person with boundaries cannot conceive of what it means to have none. We have an idea in our minds, but it is not of true freedom—it is of a state with slightly broader boundaries. That’s all. That’s a very small wish. Compassion, truth, enlightenment—these, too, are emphatically without boundary. By definition, any definition we offer up is limited, and therefore false. It falls short. We fall short. Our only hope of seeing into the true nature of things is to let the practice play itself out, and to do that, to let go of our idea of it, is to abandon all hope of fruition. Sesshin (zazen intensives of multiple days) can offer this, sometimes. Sitting all day is painful, and no one pats you on the back for it, and you could be doing any one of a thousand fun things instead. So it’s not uncommon to spend the first few days just complaining to yourself about your legs, and about the teacher, and about Zen in general, and to think, over and over, “What am I doing here? I should just leave. Maybe I’ll just leave. Maybe I’ll say I’m sick. Maybe I’ll just storm out, or maybe I’ll sneak out at the next break. Maybe I can get more kitchen duty, so I’m not just sitting here all day….” Obsessing like this is not zazen, but we cannot really separate it from zazen, either. Because one day, we wake up and realize that our legs are not going to feel better, that all the compelling reasons for leaving are not going to go away, that maybe this is not going to give us what we were looking for, and we stay anyway. Zazen begins on that day. Practice begins on that day. Our lives begin on that day. From that moment forward, anything is possible, because we have let go of what we needed it to be. Like some people sing in the car, I give Dharma talks in the car. I get an idea in my head, and on my way to this or that temple, I riff on it, try to make it come alive. This isn’t rehearsal for some future talk–these days, I do very little public speaking, and since it’s all in Japanese, it’s hardly spontaneous. I don’t know the next time I’ll sit with a group and feel free to just speak freely about practice. But I deliver these talks in the car, and as I do so, I can feel passionate about what I’m saying. No doubt more than one driver at a stoplight has looked at my face and wondered what I could possibly be so worked up about. It’s not that I give stirring talks, or that I get lost in the performance of it. I can’t measure any of those things. 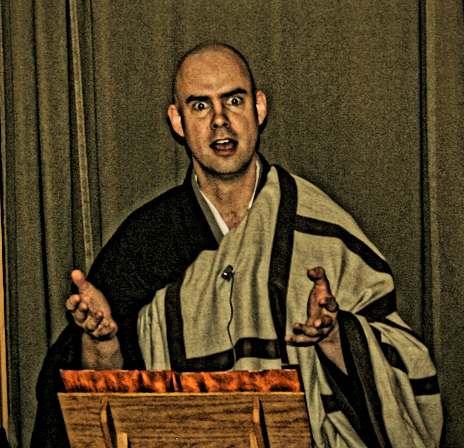 But what I have found, over years of speaking to others about Buddhism, is that my primary audience member is myself. I look back at every single talk in which I felt at all inspired, and it is clear that I was actually giving myself a pep talk in front of 10 or 30 or 200 people. I’m telling myself–as best I can–what I need to hear in order to push more deeply into the practice, or to let go of a useless idea, or to do what I know my teachers expect me to do. I’m not teaching. I’m not bestowing anything on anyone. If anything, I’m just exposing myself. 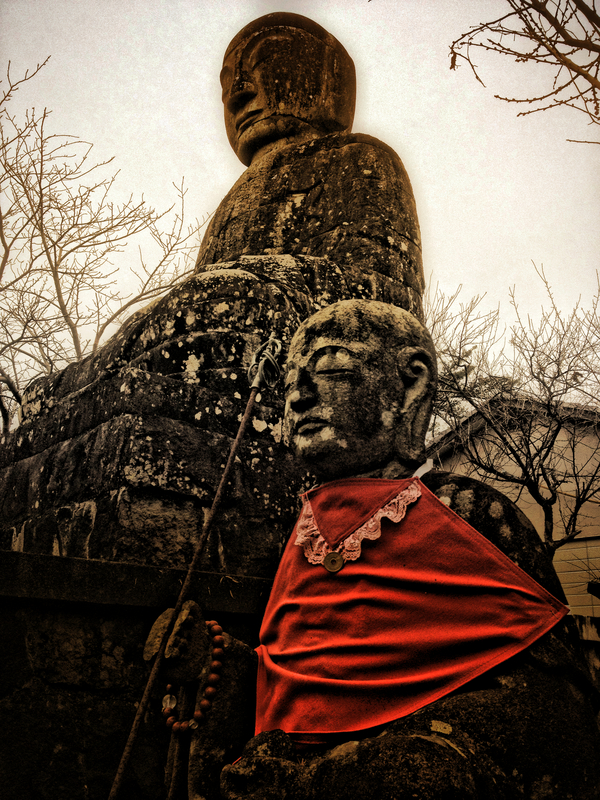 When I first encountered the teaching referred to as nyohō, it was as a novice monk, and it was simply a lens by which to measure if I was doing things properly according to the rules of the monastery. I liked it–I liked the aesthetic of it. But it was also like a set of rules, something very clearly defined, and also very limited to that traditional context. It wasn’t until after I’d left the monastery that this question of how to express the Dharma physically–and in all contexts–really came to life for me. I found that I had made that lens a basic part of how I look at the world. And in the last couple years, as I’ve looked through that lens and chewed on the questions it raises, it’s become obvious that the teaching of nyohō has profound implications for how we understand not just monastic life, but also family life, our role as consumers, our relationship to the environment, and more. It’s thorough–as one might say in Japanese, it goes all the way to the bottom. So this teaching has become a kind of soundtrack to my life, a question constantly in my ear. But that doesn’t mean that I live it out. Part of my interest in writing this blog is to have an excuse to really examine the tradition, to write down what I learned in those monastery walls and try to see how it all fits together. But the bigger goal is this: to force myself to write down those things that I intuitively know but ignore anyway. This teaching informs my day-to-day decision making in lots of little ways, but really, only when it’s not too inconvenient. I can see how one could make major changes (in schedule, in diet, in spending) in order to bring one’s life more into “accord” with the Dharma–I would like to push myself to explore more of those directions and see where they lead. So this blog, too, is a pep talk to myself–me gesturing emphatically to no one at a stoplight. Traditional ōryōki sets contain a kind of folding tray called a hattan. It’s black and shiny and crisp, and if you have a relatively new one, you’ll spend a couple extra seconds before every meal smoothing it out so that it’s flat beneath your bowls. Its primary function seems to be to waterproof the cloth below it, to minimize mess. Ōryōki sets designed for laypeople seem never to include this piece–I don’t know why. The first time I worked as a server (jōnin), rushing through the monks’ hall spooning out soup and pickles to monks seated with their ōryōki, the hattan of the godō caught my eye. First, it wasn’t black–it was a pale reddish brown. Second, it was criss-crossed with what appeared to be masking tape, at almost every folding edge. It was practically paper thin. I mentioned it that evening to some of the younger monks, and I got two responses: (1) eye-rolling, in the vein of, “Oh, I wish the godō would get over himself”; and (2) “Isn’t that awesome? Sooo nyohō.” I’d probably heard the term before that day, but in my memory, that was the first time I was able to connect the word with some concrete physical example. It was used. It was not a new, shiny object–not only was it old (I suspect decades old), but it had been carefully repaired again and again rather than being discarded. The color was what is referred to as a “broken” color. I’ve heard this defined in various (and sometimes contradicting) ways, but basically, a broken color is not a primary color, and not black or white–it is a color with its own internal, natural variation, like cloth that’s been rubbed over time. Both of the above are very much a part of the classical conversation of nyohō. They point to a recognizable aesthetic, one with concrete markers. But there are other ways in which to discuss if something is nyohō or not. A commonly raised question is this: Does the object in question arouse desire? This is tricky. Looking at the hattan, on the surface, it’s an old thing that most people would throw away without consideration. And I would suggest that even the monks that admire the godō’s way of doing things don’t actually want that particular hattan for their very own. But it can get complicated, once people start to appreciate this kind of thing, because it’s also true that some monks see that hattan and feel a desire to have one like it, or to be like the godō, or to be thought of as that kind of person. To be nyohō–to be in accord with the Dharma, to express Dharma–is a living question in every moment, in every sort of action. What does it mean to walk in a way that is in accord with the Dharma? How does one eat spinach and express Dharma? There is no endpoint to this line of inquiry (and that’s a good thing). But a starting point can be this traditional understanding of nyohō as a kind of aesthetic. The list of criteria will grow and grow from here, but as a teaser, this is an aesthetic which respects age, which encourages reusing and recycling, which favors subtle and rough over gaudy and shiny. It celebrates the dignity and simple beauty of a mat held together with masking tape. This particular tradition-within-the-tradition is predicated on the simple idea that part of practice is establishing the atmosphere of practice for others, and that there are criteria which we can apply to that process, some based on tradition, some resting on intuition. We can learn how to make that space. This is what I want to explore in this blog. This is how I want to live my life. In Shobogenzo Zazenshin, Dogen writes, “Love a true dragon instead of a carved one.” This comes from a popular story of a man in China who loved dragons. He collected figurines and paintings. He read what he could and fancied himself to be quite the expert on dragon lore. People knew him as the guy who is really, really into dragons. Well, an actual dragon heard about this man and thought it would be a pleasure to go and meet such a big fan, so she traveled to the man’s house and stuck his head in the window. When the man walked into the room and saw, there among his little figurines, the face of a real dragon, he fainted from fear (or wet his pants, or lost his mind, depending on who’s telling the story). I think most people–myself included–hear this story first as a warning not to shy away from the difficulties of practice. Don’t spend all your time thumbing through the latest catalog from Dharmacrafts–sit. Just sit. Or, perhaps, don’t choose the teacher who tells you how great you are–choose the one who frightens you a little, who challenges you in ways that surprise you, who seems to put obstacles in your way. On a larger level, we can understand it as a reminder that by avoiding those things that frighten us or make us uncomfortable, we limit ourselves and our potential. It’s a great story. I think about it often, and it always feels relevant. But more interesting than this story, to me, is what Dogen says next: “However, know that both carved and true dragons have the ability to produce clouds and rain.” This is huge. This is shushō ichinyo (修証一如, the perfect singularity of practice and realization). This points to what, for me, is the most exciting thing in the Zen world–that form and substance are not separate. 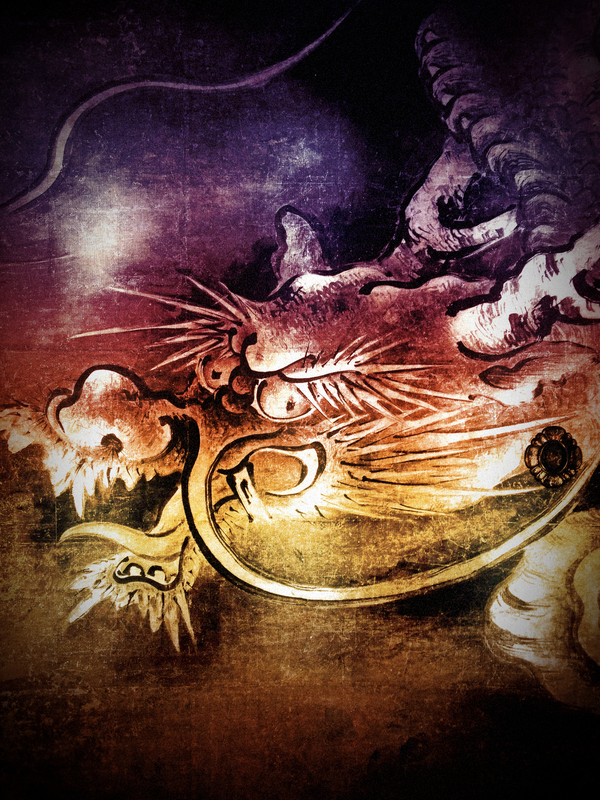 Dragons produce clouds and rain–that is part of their power. Producing clouds and rain is a dragon. And a dragon is a dragon is a dragon. The man in the story didn’t need to find a “true” dragon in his living room in order to meet a true dragon. Through his intimacy with the figurines–through his intimacy with his life–he could have faced them, and so when the curious dragon stuck her head in the window, the man could have met her with open arms. Or shooed her away, as a pest. Or ignored her. Moment to moment, we act in the world and ascribe meaning to our actions. I help a stranger who dropped her coins on the floor–it means I’m a nice guy. I break my diet–it means I’m lazy. This is automatic and mostly unconscious, but when we enter a spiritual or religious context, we actually do it deliberately. We imagine that the ability to recognize and interpret meaning is what makes us informed or deep or aware. It also makes us feel safe. For many people, bowing as one does in a Buddhist temple feels too foreign, too strange to be comfortable. So, with all the best intentions, we offer those people explanations of what it all means: “The hands coming together is the dissolution of opposites.” “You’re holding a flower in your hand and offering it to all beings.” “You’re not bowing to the Buddha–you’re bowing to buddha nature.” I’ve heard a lot of these. But Zen practice, at its heart, is just bowing without reserve, and letting that action stand on its own. If we can completely bow, then that’s the true bow; but if we talk ourselves through it, imagining that this is merely a physical representation of some deeper philosophical concept, then that is an imitation of a bow. The encounter passes unnoticed. If you practice zazen, you can ask yourself: “What do I think it means? What do I think it means about who I am, or who I’m becoming? What do I think is the point? What am I trying to achieve?” The extent to which we can then let go of those questions is the extent to which we can do zazen, which is to say, the extent to which zazen can be zazen. This is true in every second of our lives, in every action. It takes great faith and courage, I think, to let one’s life, in this moment, be as it is. Each moment of each day is producing clouds and rain. Each moment is shaking the sky with its own power. With this action, right now, we can make the heavens and earth tremble and roar. But to do that, we need to see the dragon in all directions, all around us, inside us, in the soles of our feet and in our hands and with the same eyes that we use to look on the world. Let go of “real” and “unreal.” “Unreal” is about what we cannot yet see. Nothing unreal exists.